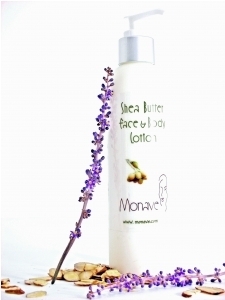 Monave lotions use Nature’s magic: Shea and cocoa butters, organic plant oils, and floral waters, to soothe and moisturize dry, parched skin. Our emulsions are 100% natural with no synthetic waxes. As soft as pudding, and richly fragranced with essential oils: Try some; your skin will thank you. All body lotions are gluten-free. Cocoa Butter Lotion Ingredients: Distilled Water, Lavender Hydrosol, Aloe Vera, Organic Cold-pressed Sweet Almond & Jojoba Oil, Sunbleached Beeswax, Cocoa Butter, Sodium Borate, Soy Lecithin, Seaweed Extract, Xanthan Gum, soy-based Vitamin E & Essental Oils of Lavender, Sweet Orange and Peppermint. Shea Butter Lotion Ingredients: Distilled Water, Rose Bulgaria Hydrosol, Lavender Hydrosol, Aloe Vera, Organic Sweet Almond Oil, Apricot Kernel Oil, Unrefined Shea Butter, Sunbleached Beeswax, Soy Lecithin, Seaweed Extract, Xanthan Gum, soy-based Vitamin E , and Essential Oils of Lavender, Sweet Orange and Peppermint. 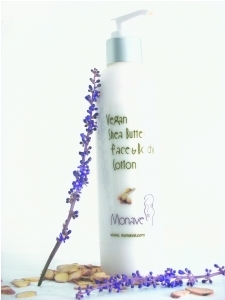 Vegan Shea Butter Lotion Ingredients: Distilled Water, Organic Sweet Almond Oil, Organic Apricot Kernel Oil, Vegetable Acetyl Alcohol, Shea Butter, Lavender Hydrosol, Soy Lecithin, Seaweed Extract, Xanthan Gum, soy-based Vitamin E, and Essential Oils of Orange, Lavender and Peppermint. Shea Butter Ingredients: Unrefined Wildcrafted African Karite Butter. 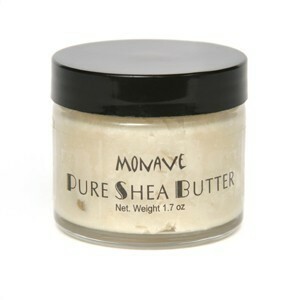 A superior, quick-absorbing formula that has all the benefits of shea butter without the greasy feel. Pure flower water, organic oils, and natural thickeners are blended with the natural fragrance of lavender and sweet orange. Cocoa butter has been used for centuries as a moisturizer. It provides one of the highest levels of protection. 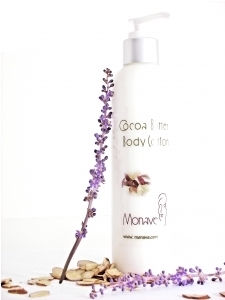 Monave cocoa butter lotion can be used on dry, cracked elbows, feet and hands.